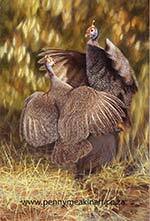 "Woodland Guineafowl". Oil on canvas-board, framed, 1150 mm x 840 mm incl. frame. 'No time to lose'. Acrylic on Canvas, 970 mm x 700 mm..
"Crested Guineafowl". Oil on Gesso board, framed, 980 mm x 780 mm. "Quiet Time". Large Oil on Gesso Board. Framed, 1480mm x 1040mm incl. frame. 'After the Rain' Oil on Gesso Panel. 1470 mm x 1090 mm. 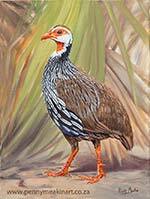 'Bushveld Guineafowl' Oil on Gesso Panel. 1080mm x 840mm. 'Greywing at Golden Gate'. Oil on Gesso panel. 950 mm x 750 mm. 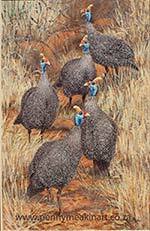 "'Guineafowl Sundowners'" Oil on canvas, 1080 mm x 840 mm. "Guineas in the path". Oil on textured board. 700mm x 980mm. Chobe Buffalo Oil on Gesso panel. Red necked Spurfowl. Oil on Gesso panel.610 mm x 680 mm. Dawn Dispute Oil on Gesso Panel. The Amphitheatre at dawn. Oil on canvas board. Crested-Guineafowl Oil on Gesso Panel. 1240 mm x 940 mm. "Cape Turtle Doves" Acrylic on canvas. "Guineas in the road" Oil on Gesso panel, 750 mm x 630 mm.